Go forward in time to December 2007. Back again in Curicó after the third travel of this month, I'm feeling tired and in need to focus on my thesis in order to finish it. The local GNOME activism and bits of hacking have consumed a lot of my not-actually-free time, and I've neglected the work on it. So be sure that during the next weeks, I'll be less responsive and probably a bit apart from the life. The travel to Valparaíso was interesting, to say the least. The day at the INACAP conference was full of surprises, not all of them nice, but they do deserve a deep analysis that will be done when proper. I had a really lovely evening yesterday with Eduardo and Evelyn, who were my hosts in Valpo. Thanks a lot guys! This weekend was the 2o Encuentro Regional de Linux in Talca, which really rocked. I had a great time there with all the guys and the local community (see the pictures in flickr). Kudos to the organizers! I arrived after the conference in Curicó last night, and am right now off to Valparaíso, for an Open Source event the local INACAP is organizing and will take place from tomorrow till Thursday. Seems it's gonna be a big event! For some time, I've been maintaining gyrus, but day to day my commitment to the project, due to different reasons, has decreased to the point that in the last months, I've been only cleaning code, committing bug fixes, and releasing in order to get new translations and fixes packaged. On the other hand, Alejandro, the original author and maintainer of gyrus, has started a few weeks ago a complete rewrite using Python. The reason: he strongly believes that Python would make gyrus much more maintainable and easy to hack on. As I don't really have a strong opinion about it, and know that I'm not really going to do much more work on the project, I've offered Alejandro to create an experimental branch in the gyrus SVN, where he can work on implementing a much better IMAP cyrus administration tool. He has always been the number one user of gyrus, so I really trust that he knows much better than me what users expect of such a tool. Regarding the current C version, I'll keep on doing maintainer work, if any, and will do some releases as new translations arrive and bugs are fixed, but don't plan to hack anymore on it. As soon as Alejandro's version becomes good enough to replace the current version, we'll merge his branch to trunk, and he'll get my bless as the new maintainer of gyrus. So, everyone is invited to play with the python code which is now available in the gyrus SVN: svn co http://svn.gnome.org/svn/gyrus/branches/gyrus-python. Discussion, as usual, can go to the gyrus mailing list, and patches/bug reports	to the GNOME Bugzilla. Continuing the conferences hype, this Friday and Saturday in Talca will take place the 2o Encuentro Regional de Linux, organized by the students of the Universidad Autónoma de Chile, sede Talca. Good that many of the GNOME Chile crew will be there, so we'll probably have a lot to discuss about the near future of our group. Saturday was the day of the 3er Congreso Austral in Puerto Montt. The congress went pretty well and I really think the organizers did a great job on putting every piece together for the day. It was a lot of fun to meet so many enthusiastic people and to realize that, even when they are a small community, they have a lot of energy and are working in several interesting projects. We had lunch in a really nice restaurant close to the campus, in the area called El Pelluco. The restaurant was lovely and the dishes were huge and great. The organization chose it very well! Even when I was terribly tired, I enjoyed the day entirely. My talk went pretty well, and with the help of the audience we cooked a small patch to add mouse zooming ability to the print preview widget of the Eye of GNOME, which is now lying in bugzilla in need of a few improvements that I hope to make during this week before committing. I think the tutorial went pretty well and all the attendants followed the coding and explanations closely. I avoided nasty details explanations in order to focus in the methodology used in the GNOME project (by using svn, bugzilla, autotools, generating patches, and so on). It was a nice experience, as usual! During the evening, the guys visited Angelmó, but I preferred to get some rest at our hotel because I was about to die of tiredness. After bout an hour of sleep, I met the rest of the local crew and had some fun. I want to give huge thanks to the people behind the congress, specially to Daniel, Moisés, and Victor Hugo. You guys really did a great job with the organization and also treated us the speakers like kings. Thanks for everything! The second day of the lovely trip. More to come in the next posts. 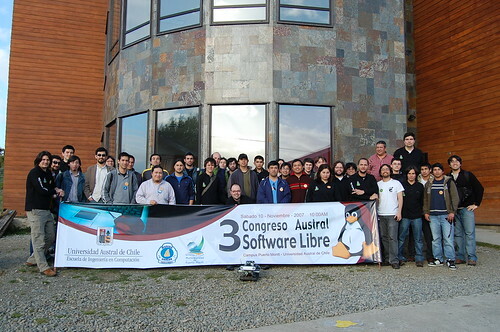 On Thursday, I flew to Puerto Montt for the 3er Congreso Austral de Ciencia de la Computación, organized this year by the local Linux Users Group and devoted to Free Software. 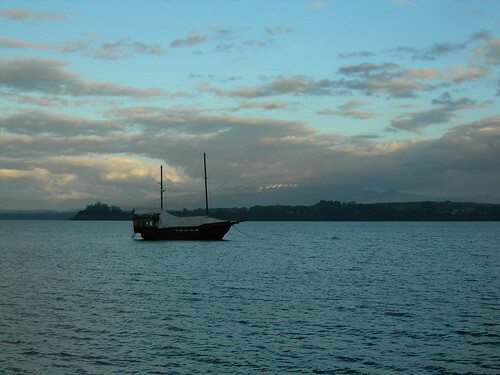 As I had Friday free, I made a trip to Puerto Varas, a really beautiful city located 15 min. from Puerto Mont. The city reminded me immediately of Germany, given all the German traditions and German looking people that live there. I took a walk and made tons of pictures and later had lunch in Donde el Guatón, before continuing my journey. I took a minibus and traveled to the Saltos del Petrohué (Petrohué Waterfalls). The trip by the lakeside of the Lago Llanquihue and the view of the Volcán Osorno are really amazing and beautiful. Too bad that I didn't have enough time to stop in some of the beaches but the final destination really deserved the best attention. I also wanted to go further to the Lago Todos Los Santos, but I would have needed an extra couple of hours that I didn't have. Anyway,	after about two hours travel in the minibus, I got to the Saltos. They really, really deserved the long trip. Once back to Puerto Varas and before traveling back to Puerto Montt, I met Eduardo, who was waiting for me in the Casino. 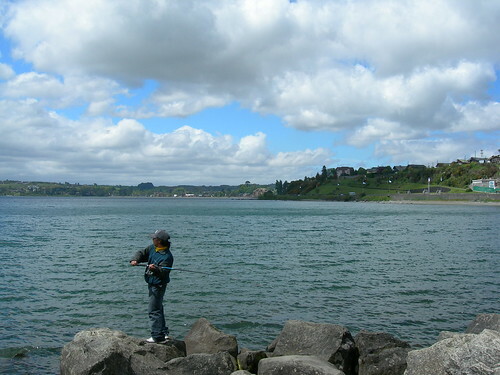 We made some pictures before returning to Puerto Montt. The first day of a lovely journey to the south. 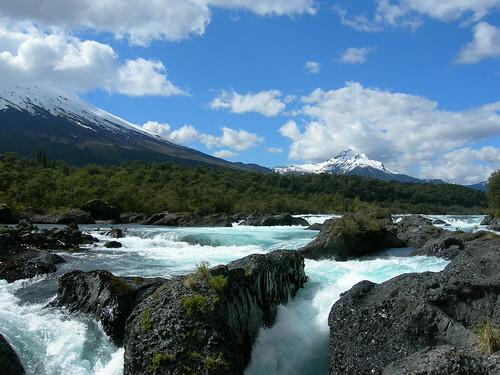 More pictures in the Puerto Varas and the Saltos del Petrohué flickr sets. The Día del Software Libre in Curicó is showing its first results: The AMaule has published the first number of Acceso Libre, a magazine devoted to Free Software that will be published twice a month. Congratulations to the people involved! Go backwards in time to October 2007.